First Struck by the Austrian Mint in 1989, the Vienna Philharmonic Coin was the first gold bullion coin to be denominated in Euro Currency. 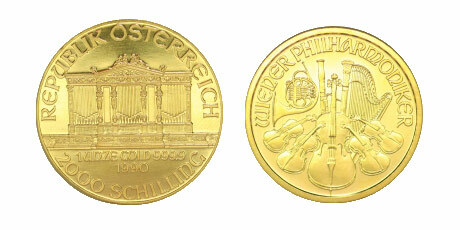 The Austrian Philharmonic is the best-selling gold bullion coin in Europe. During the peak of the worldwide financial crisis in 2008, more Philharmonics were sold worldwide than either U.S. Eagles or Krugerrands. The Vienna Philharmonic is struck in pure gold 999.9 fine (24 karats). The design on the obverse of the coin depicts the great organ in the Golden Hall in Vienna’s Musikverein, the concert hall of the Vienna Philharmonic Orchestra. The face value in Euros, the weight, alloy purity and year of issue are also inscribed on this side of the coin.